Hi everyone! Today, I'm crafting along with the lovely and talented Tracey McNeely over at In My Creative Opinion. 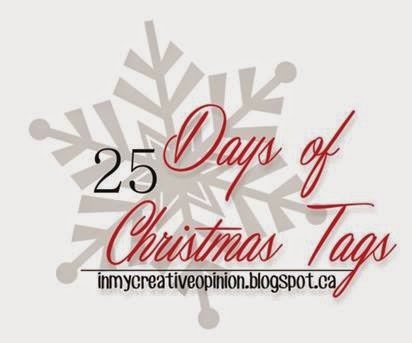 She's been featuring 25 Days of Christmas Tags and has invited a bunch of folks to share a tag. Great idea, right? Thank you to Tracey for the invite to play along with your fun parade of tags! Don't forget to check out Tracey's blog and leave comment for some cool prizes! And check out the rest of the fun holidays tags! Thanks so much for stopping by! Dude! sooo Cool!! Homemade vanilla? How does one get on that gift list? Very adorable tag and a fabulous idea!! Love The Idea to use tag as a gift card holder. That little snowman is just adorable! Love the cool tag JJ (pun intended) to use the tag as a gift card holder is brilliant! Thank you for joining me today as my guest on the 25 Days of Christmas Tags! Such a cute tag. I love that it holds a gift card. So cute!! How kind of you to share christmas cheer at your office! the tag is darling. I'm going to miss not have this daily inspiration when the week is over. 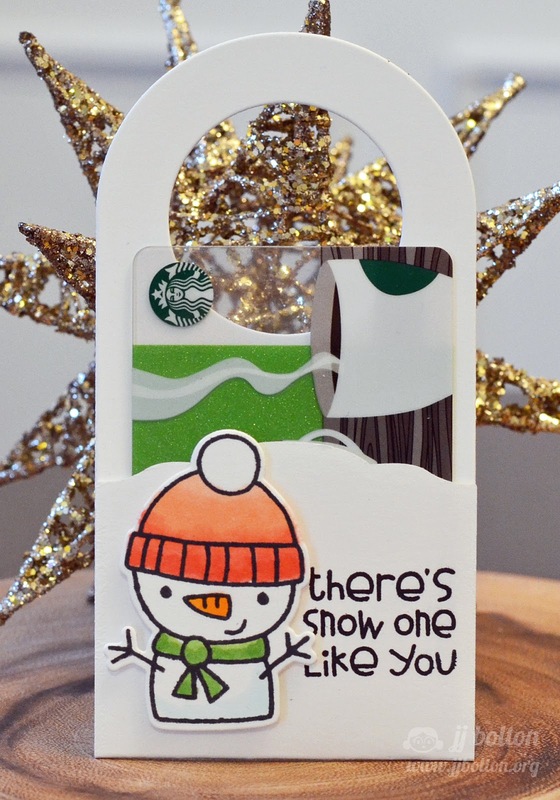 Adorable tag/gift card holder idea!!!! Super cute and creative! Very cute gift card tag! So cute! Love how you modified the bottle tag die for this! Both a tag and a gift card holder - what a great idea and it's cute too. I love the idea of a gift card holder tag and your is delightful. Well done. This is awesome! Homemade vanilla? Sounds so good. Love your delightful gift card holder/ bottle tag! Sweet snowman! You are so clever, JJ! I love your tag, and your coloring is just beautiful! I'm sure your co-workers are going to love it, too! So sweet! Wonderful gift card holder! This is so clever; I love it. This is just so sweet! Adorable! Love the combo bottle tag/gift card holder. What a fabulous idea...A gift card WITH tag...your a genius!! SUPER CUTE snowman, SWEET sentiment and FABULOUS tag JJ - LOVE IT ALL!!! LOVE how you folded the bottle tag to make the gift card pocket too - a VERY COOL way to give them => THANK YOU for sharing your CREATIVE INSPIRATION!!! Homemade vanilla? And the bottles decorated with this ADORABLE tag? Oh my, JJ, your gifts are going to dazzle and delight those lucky recipients! LOVE your creativity showcased here! How darling! I love that this tag is a gift card holder! Fabulous tag! The homemade vanilla sounds awesome. Sweetest snowman ever! Great way to make a gift card holder! Thanks so much for sharing! Oh how cute are these cards! Studio Calico Park Ave Reveal!